What is your must-have dish for your Christmas feast? Remember that my friends and I were cooking Martha Stewart's recipes for Christimas last year? I remember reading at Mich's post that she wish to bake a yule log cake for her kids. Actually, I wish the same too. I must confess that I did bookmarked Martha Stewart's Bûche de Noël at that time but was too chicken to attempt this super-challenging recipe... shame shame! This Christmas, I promise myself that I have to be brave. I need to bake Martha Stewart's Bûche de Noël and so I suggested the theme, Yule Log cake for our bake-along with Joyce from Kitchen Flavours and Lena from Frozen wings... Evil me again! LOL! At times, I do feel like chicken-out again by choosing other yule log recipes like the straightforward Nigella Lawson's flourless one at here and also the easy-plus-less-guilty one at BBC GoodFood but I have finally convinced myself that I can do this. The ultimate and fanciful Bûche de Noël in Martha Stewart's recipe contains four main components; chocolate genoise, chocolate mousse, chocolate ganache icing and Italian meringue mushrooms. I have made my Bûche de Noël mostly according to Martha Stewart's recipe. In fact, nothing major has been changed except that I have made light cream cheese filling instead of chocolate mousse filling because I prefer to avoid using raw eggs for this bake. Happy? Of course! Feeling proud of myself that I have made this cake. LOL! This is the Bûche de Noël that I baked specially for our Christmas 2013... Happy? Of course! The three chocoholic us are enjoying a lot of chocolate this Christmas. This is it! This is my last post for the year 2013. Although we are not going anywhere far and away this holidays, I have promised to spend more time with my family this festive season. My apologies if I have not been active in my blogging and I promise to be back early 2014 to summarise Cook Like a Star, Bill Granger event and to check out all yule log cakes that have been baked-along with us. Merry Christmas and Happy 2014!!! Please cake!!! Please don't be too dry or stick on your rolling surface... Please behave! Check out these mush-mallow... LOL! I didn't like the idea of using raw eggs to make chocolate mousse and so I made this instead. 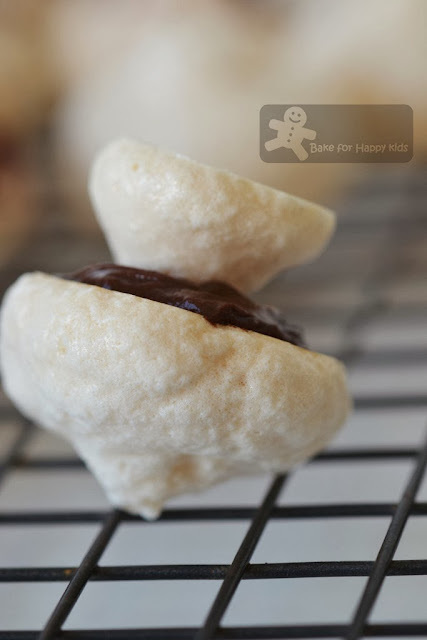 Cream cheese chocolate filling... Yum! phew! I managed to roll the cake with minimal damage! To assemble cake, carefully un-roll genoise on the back side of a baking sheet (discard the plastic wrap and waxed paper, but keep the towel) - I have un-rolled mine onto a sheet of baking paper dusted with cocoa powder. 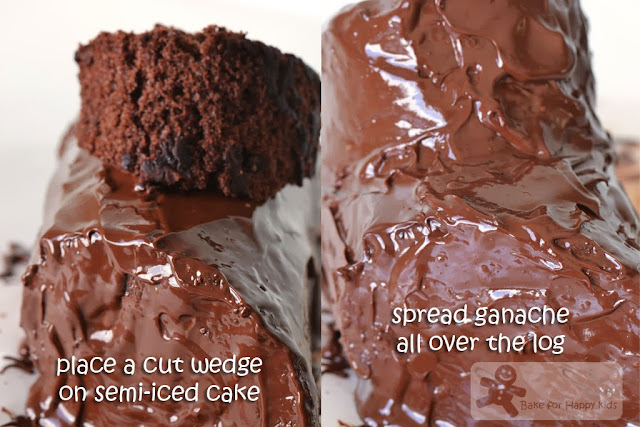 Spread chocolate mousse (or chocolate cream cheese filling) evenly on cake to within 1 to 2 inches of one long end. Re-roll cake, starting from other long end, using towel to help roll it. Cover with plastic wrap; chill until firm, about 1 hr - I rolled the cake from the short end because my cake didn't have a thick filling and might crack being too thin. Place cake, seam side down, on a serving platter; tuck parchment around it to keep platter clean while decorating. To avoid mess, I have placed four strips of baking paper to form an outline around the cake. Whip ganache at medium speed until it has the consistency of soft butter - I didn't whip the ganache and all I did is to stir it as it cool until the right consistency. Cut two (or one) wedges off ends of cake at a 45 degrees angle; set aside. Ice log with a thin layer of ganache. Attach wedges on diagonally opposite sides of log (or on top). Spread ganache all over log, using a small spatula to form bark-like ridges. Chill until ganache is firm, about 30 mins. 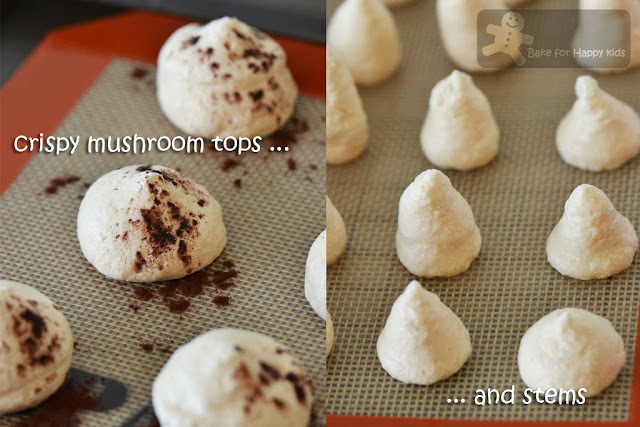 When ready to serve, remove the four strips of baking paper, arrange meringue mushrooms around and on cake, and dust lightly with confectioners' sugar. Heat oven to 350°F (or 160°C fan forced). Butter a 10 1/2-by-15 1/2-by-1-inch jelly-roll pan (Mine is 25 x 35 cm). Line with parchment / baking paper; butter and flour paper, tapping out the excess flour - I didn't butter and flour the paper. 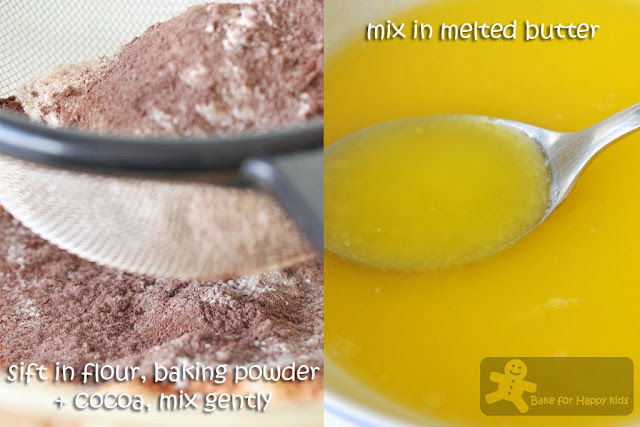 Sift flour, cocoa, and baking soda / powder together twice into a medium bowl. Set aside. In a small saucepan over low heat, melt butter. Skim off white foam, and pour clear yellow butter into a bowl, discarding white liquid at the bottom - I didn't do this and used everything in the melted butter. Set aside in a warm place. In a medium-size heat-proof bowl, whisk together eggs and sugar. Set bowl over a pan of simmering water; stir until mixture is warm to the touch and sugar has dissolved - Yes that I did do this step but didn't have a good photo showing me doing this. Ops! Remove from heat, and beat on high speed until mixture is thick and pale and has tripled in bulk. 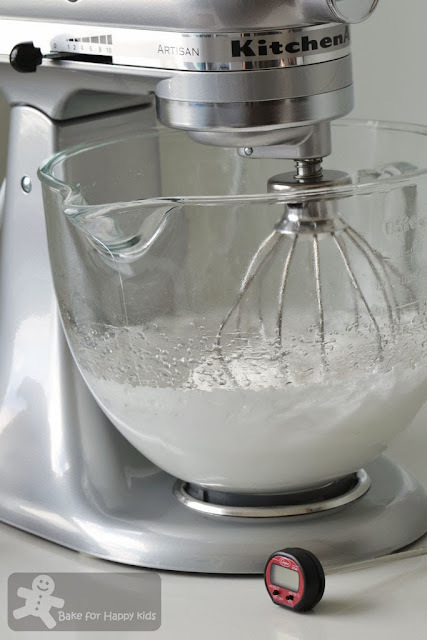 Reduce speed to medium, add vanilla, and beat 2 to 3 mins more. 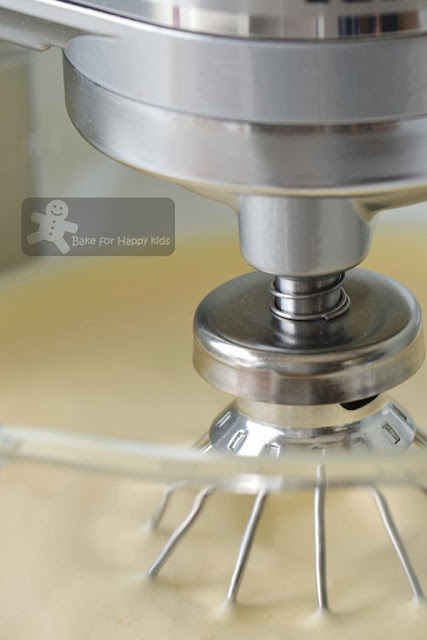 Spread batter evenly in pan, leaving behind any unincorporated butter in the bottom of the bowl. Tap pan on counter to remove air bubbles. Bake until cake springs back when touched in center, 15 to 20 mins - I baked mine for 15 mins. Don't over-bake or cake will crack. Let sit in pan on a wire rack until cool enough to handle. Dust surface with cocoa powder. 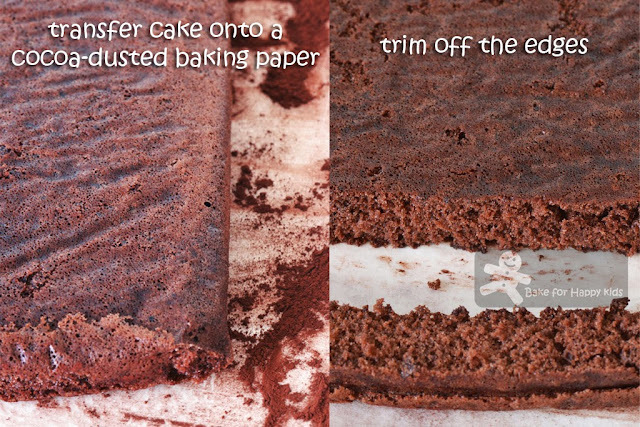 To make rolling easier, trim edges of cake, and cover with a sheet of waxed paper (or baking paper) and a damp dish towel (I didn't use this). Invert onto a work surface, and peel off parchment; dust with cocoa. Starting from one long end, carefully roll up cake in towel. Wrap in plastic; refrigerate until ready to use. Instead of making chocolate mousse by Martha Stewart which contains raw eggs, I have adapted a light and easy chocolate cream cheese filling from BBC GoodFood to fill my yule log. Place chocolate in a medium heat proof bowl. Heat a small pan of water (one-third full) until boiling, remove it from the heat, then sit the bowl of chocolate over the top. Leave for a few mins off the heat until melted. Otherwise, you can melt the chocolate in a microwave with medium-low power. Remove the bowl from the pan, then leave the chocolate until it is cool to the touch. Add icing sugar, cocoa powder and coffee granules into melted chocolate and mix by hand until well-combined. 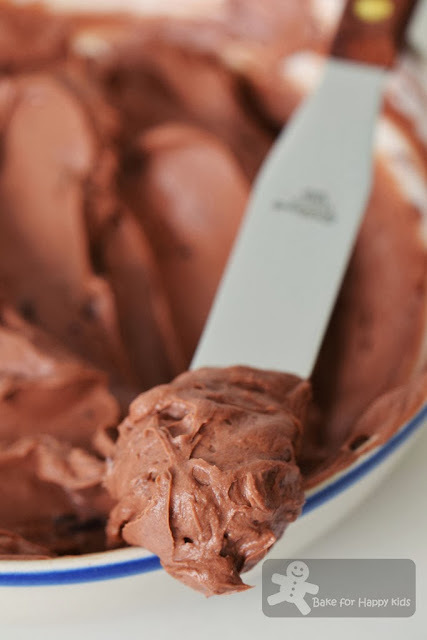 Add cream cheese into the chocolate mixture and stir vigorously until smooth. Place chocolate in a medium bowl. 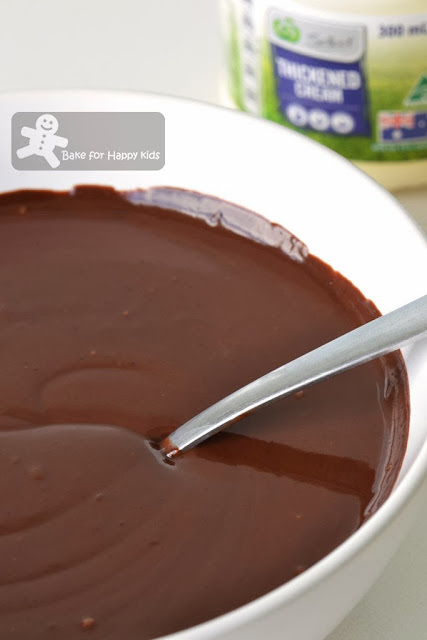 Heat cream in a small saucepan until bubbles begin to appear around edges (scalding); pour over chocolate. Let stand 5 mins, then stir until smooth. Set aside at room temperature until cool but pourable, stirring occasionally. Note: I made only 2/3 of this recipe for my log cake and the amount is more than enough to ice my cake and glue my meringue mushrooms. Heat oven to 225°F (or 100°C fan forced). Line a baking sheet with parchment paper (or baking silicon mats), and set aside. In a small saucepan, heat sugar and 1/2 cup water over low heat until sugar dissolves. Bring to a boil; cook until liquid reaches 248°F (hard-ball stage) on a candy thermometer. Meanwhile, in the bowl of an electric beater fitted with the whisk attachment, whip egg whites on low speed until soft peaks form. Increase speed to high, and add hot syrup in a steady stream, beating constantly. Continue beating until cool and stiff, about 5 mins. Beat in vanilla. 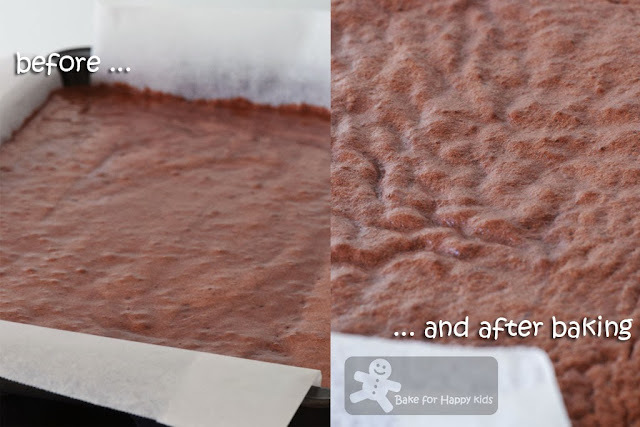 Fold in cocoa powder - I didn't add any vanilla and cocoa powder. 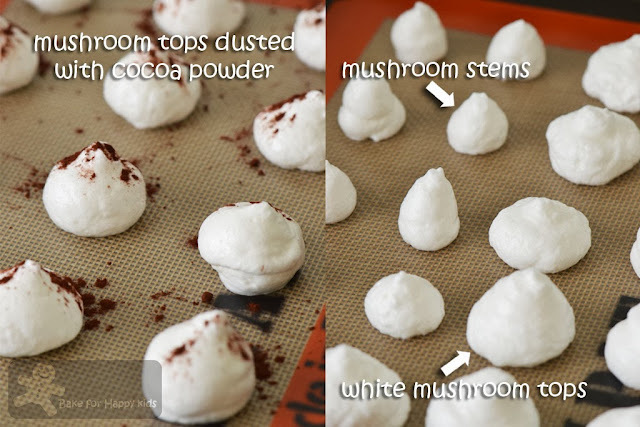 Sprinkle cocoa powder lightly over meringues. Bake until dry, about 2 hrs - I did mine for 1 hr 45 mins. Store in an airtight container until ready to use. Note: I made only 1/2 of this recipe to bake 27 mushrooms to decorate my log cake. Once the mushrooms were assemble with chocolate or chilled, they tend to absorb moisture quickly and need to be consumed within the same day. Happy Brave Baking and Merry Christmas! Beautiful chocolaty Christmas Log! And the meringue for the mushrooms looks cute! I thought of using Rachel Allen's recipe, but did not have enough of chocolate!! Haha! But am happy with the one I've made, it was good. Thanks for selecting this theme, now I can cross off Christmas Log from my list! Merry Christmas! Enjoy your time with your family! Christmas celebration should look complete with this log cake... beautiful dessert. I think I came across your blog when I was reading PH's blog rolls.. 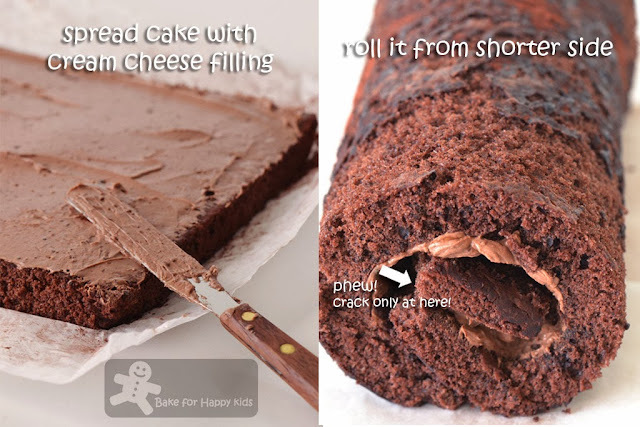 When I see "Bake For Happy Kids", I remember straightaway..Just that I didn't leave any comments..
Oh my, I just have to look at your chocolate log cake with chocolate cream cheese filling many many times.. Oh, and the ganache, if I could, I would have used a thick straw (the bubble tea straw) to slurp all that ganache in the bowl.. Your blog is so pretty..
Hello Zoe. Beautiful log. I am on a long holiday. I baked a red velvet roll with white choc cream cheese before I left but was busy with packing, so didn't have time to write and share. Merry Christmas and god's blessings to you. 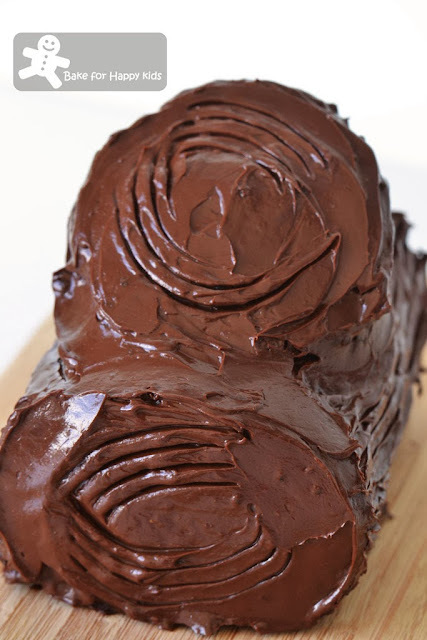 Your log cake looks beautiful and the texture looks smooth too! We never have anything this glorious for Christmas dessert, but I remember making buche de noels in my high school French class. Wow, very impressive, We dont celebrate christmas over here :). Hope you have a wonderful christmas and have a happy new year. I have always wanted to try my hand at a buche de Noel. Yours turned out beautifully. Thank you for sharing this sweetness! I hope you have a blessed Christmas! yeah, you are quite evil sometimes ...LOL! remember that pavlova? another challenging task..! i was also looking at the meringue mushroom the other day..thot they are really cute..but you know lah....the lazy bugs are biting me...nice log and indeed very chocolicious! Enjoy your hols zoe, you've been working hard, have a wonderful christmas , small feast big feast not a problem..Cheers! Me me me! I'm chocoholic also! I also made Swiss roll and haven't had time to write the post.... Not a big thing in my house but it's a must hv in the house... I make everyone (actually only my hubby and visiting guests really) swallow a slice.... Love ur meringue mushroom. I wanted to make it.... But oh well... I wanted to make it like I said... Too lazy... So salute u! Beautiful buche-de-noël, looks like a challenging task but you've certainly nailed it, Zoe. Happy Christmas and a happy New Year. Happy Christmas, Zoe - your chocolate log looks lovely! 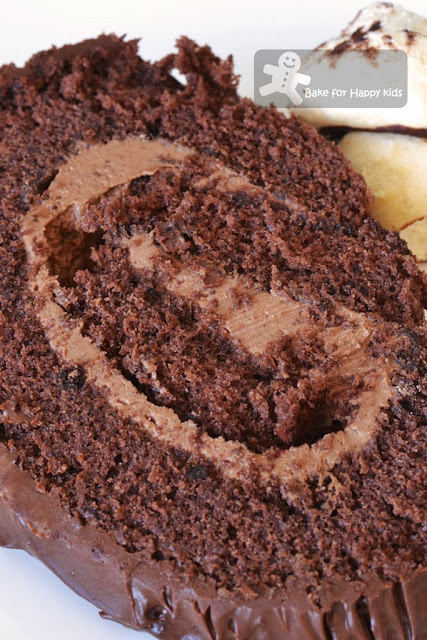 Nice and chocolaty log cake! Merry Christmas and happy holiday, Zoe! Oh my! This is so sinful! I think I will put on weight after this delicious meal! Looks great. Seasons Greetings to you and your family. Zoe, what a whole lot of work and so worth it! I would have fainted halfway hee..hee...Your cake does resemble a log (a delicious one!) and the "mushrooms" are so cute! And here's wishing you and your family a Merry Christmas and Happy New Year! As I was just "saying" to Lena the other day, I too am a bit intimidated when it comes to Yule logs. You did fantabulous, Zoe!!! We don't have huge dinners either for Christmas as it is only going to be Marion and myself this year. Last year I was in Idaho with the grandchildren and my daughter. I do believe she made Martha's Bûche de Noël with the chocolate Ganache. 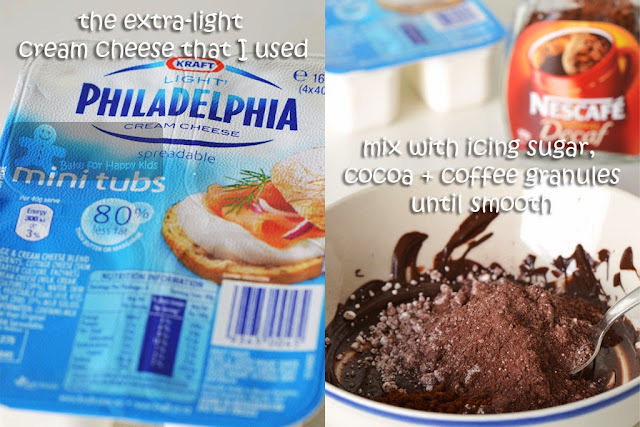 I would love to try it with the chocolate cream cheese filling you made. I bet it is/was delicious!!! Thank you so much for sharing, Zoe. Have beautiful Christmas with your family and wishing you and yours a Happy New Year! "See" you next year!!! Passo per un saluto e per Augurarti un Buon Natale . Gracias Zoe por su saludo ....maravilloso tronco de Navidad tenga usted una Feliz Navidad junto a su familia tambièn,hugs,hugs. Very chocolatety log cake. Great for festive dessert. Have a nice holiday with your family. Merry Christmas and Happy New Year! Wishing you and your family a Merry Christmas and a Happy New Year ! 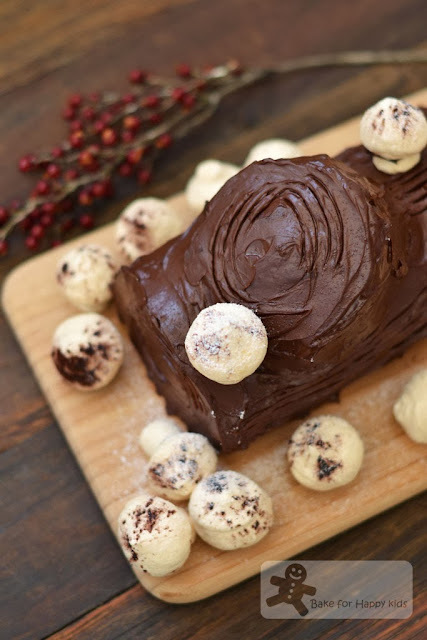 As a fan of chocolate, I would love this yule log cake. Yum! For Christmas I will be joining two friends for a late lunch. They are making chorizo stuffing for me. I can't wait. Have a wonderful Christmas! That looks absolutely incredible, I'm not a fan of most Christmas puddings with all the dried fruit and spice but I LOVE chocolate log cakes and this looks like the best one ever! Like Louise, I am too afraid to try out this Bake Along lol! way too much delicate work, no sir, not for me lol! 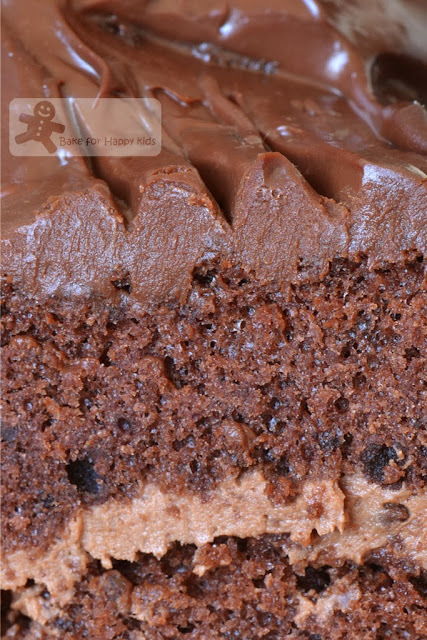 I'll drool over yours, looks super moist and chocolatey indded! Merry Christmas! Hi Zoe, for years...I've been wanting to make this beautiful and festive chocolate log, which is such a classic holiday cake, and has been for decades. Never goes out of style, and you my friend has done an amazing job re-creating this lovely holiday classic. I so, want to make this, but keep saying...next Christmas, LOL! This looks so great! You're truly a terrific baker. I hope you and your family are having a wonderful holiday! Zoe, Merry Christmas and Happy New Year to you ! Un lujo de cake se ve muy irresistible me encanta,Abrazos y Feliz Año Nuevo abrazos y abrazos. What a beautiful log cake, Zoe. Wishing you a Happy New Year! And a wonderful 2014 ahead! Hi Zoe, your log cake looks really good! I made a mega log cake but I don't think it's special enough to blog about it because I've made all the components before... so can't join you all for this Bake Along! Well, there's always next time, right? Hope you had a great Christmas and happy new year to you and your family! Cea mai buna alegere, in materie de preturi mici, o reprezinta magazinele de calculatoare second hand. Awesome log Zoe...I hope you had a lovely Christmas. hi Zoe! love the super chocolaty log cake! wish you a very Happy New Year! and this cake is a chocolate treat! Merry Christmas and a Very Happy New Year, Zoe.